Dizzy spells are anything but pleasant, and those who suffer episodes of the disorder are justified in seeking the fastest possible way toward relief. Luckily, there are several things that can be done to stop symptoms before they even start, building up a tolerance that serves throughout the day. Read on to discover five exercises that can have you balanced in no time. Some of the most effective exercises for dizziness are ones that involve movement, as the condition is likely to be the most disruptive while the individual is naturally in motion. Sufferers can bolster their tolerance levels for feeling less bodily control by walking across a room, first with the eyes open and then with them closed. At first, walking next to the wall can help, and later a more difficult course can be pursued, walking up and down a slope or even the stairs in a similar way. Dizzy spells are often brought on by disruptions to the inner ear, which plays a major role in keeping balance. In a comfortable environment, exaggerating this sensation can lessen actual symptoms when they spontaneously occur. Shaking the head back and forth, then up and down, can accomplish this end, and is additionally one of the exercises for dizziness that can be practice anywhere, at any time. 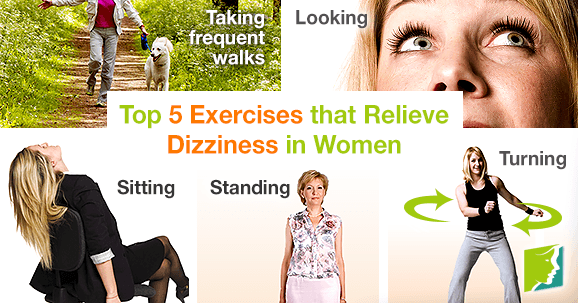 Exercises for dizziness that re-train eyesight can also help reduce normally-occurring episodes. One method is to keep the head still and move the eyes slowly up and down, then left and right, increasing in speed as dizziness becomes less common. Alternatively, focusing on a specific, moveable object like a playing card can do the same thing. Many also benefit from exercises for dizziness that shift balance entirely, simulating a dizzy spell while remaining prepared to handle it. Standing with the feet shoulder-width apart and arms at the sides, it can help to shift weight from the front to the back of the feet while keeping toes and heels flat on the floor. This provides just enough lack of balance to induce dizziness, and should be practiced in 20 repetitions twice a day for best results. Swift movements such as turning around are among the most common triggers for this disorder, so exercises for dizziness that keep that fact in mind can be highly effective. One that works well for building up this particular tolerance is to keep feet slightly apart and turn 180° to alternate sides, stopping for ten seconds between each rotation. Repeating this five times, twice a day, can make a big difference to episode intensity. Exercises for dizziness, like the ones listed above, are quick, simple, and effective methods to keep the worst of the condition at bay. When added to a regular aerobic exercise routine and a balanced diet, they can bring on favorable results before you know it. For further information on how to handle dizziness, follow the link below. Constant dizziness can be very disruptive to those who suffer from it, but there are ways to regain balance once again.